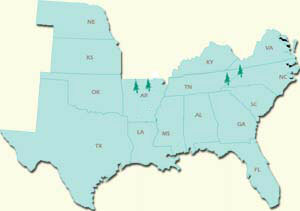 Experimental forests provide places for long-term science and management studies in major vegetation types of the US. Beginning in 1908 the Forest Service established a network of Experimental Forests, primarily within National Forests, to research pressing issues regarding the rehabilitation and conservation of depleted forest and rangelands. These experimental forests are all primarily oak dominated forests within the central hardwood region. Long-term experiments conducted on our experimental forests are focused on developing knowledge and strategies for restoring, managing, sustaining, and enhancing the vegetation and wildlife of southern upland hardwood forests. Studies in the Bent Creek Experimental Forest that continue to provide information on silvicultural questions include the Buell rehabilitation plots set out in 1931, and the farm woodlot single-tree selection study established in 1946. Experimental forests may also be used for research purposes by universities and resource management organizations. Nonmotorized recreation activities such as hiking, hunting, and mountain biking are permitted on designated trails within some experimental forests. When you visit our experimental forests, please follow the rules and remember that the primary designation of these areas is for research on forest ecology and management; research study sites must not be disturbed.